Arctic Char is a fish that falls somewhere between salmon and trout in both flavor and texture. It's a terrific source of Omega-3 fatty acids! 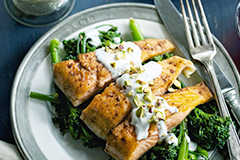 If you can't find arctic char, you can substitute salmon or red snapper in the recipe.